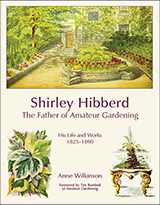 Shirley Hibberd was the first person to successfully promote amateur gardening at a time when it was reviled by the horticultural establishment. He had the courage of his convictions and believed that if he had learnt to do things himself, he could teach other people the same things. If you think home vegetable gardening, urban bee-keeping and vegetarianism are new, then think again. Shirley Hibberd could be your hero, as he was indulging himself in these things 150 years ago. See shirleyhibberd.co.uk for more details.